Follow these simple steps and you could be sitting in your new dream home before you know it! First, work with a real estate agent that you trust. You need to have faith in their abilities and experience. If you are constantly seconding guessing their advice, this will only add to your stress, not reduce it. You want to work with an agent that answers your phone calls, texts and emails, and stays in touch with you every step of the way. Home buying is about decisions. There are large ones, like which area of town you want to live in, which home plan is right for you, what your budget is, who to use as a lender, etc. And there are small ones, such as whom to complete the termite inspection. The way to keep stress low is to make informed decisions and then let it go. Don't beat yourself up over what could have been or what you should have done. Hindsight is always 20/20. Along those same lines, remember the phrase, 'Too many cooks in the kitchen spoils the broth.' Yes, there are family members and friends who have great advice to share. However, asking too many people for their opinions can distract your mind from your own wishes and wants. Be careful to keep the advise in moderation. This is your decision after all! Avoid 'cocktail talk' too. It seems invariably that there are always those that say they got a better deal than you did, a lower interest rate, more concessions, blah, blah, blah. Often times, you may be getting part of the story or they don't truly understand the process. Don't allow braggarts and fibbers to make you second guess your decisions. More often than not, they are just trying to make themselves feel important and you feel less important. Steer clear of such toxic talk. There is no 'perfect' house or deal. There will be things that don't go as planned. Now is the time to focus on the good things about the move and the deal. Don't get bogged down in the little things. Buy a house that you love and that makes good financial sense. And finally, plan ahead. It is tempting to channel Scarlett O'Hara and worry about things tomorrow, but time is of the essence when you're buying. Deals can move quickly and between hiring inspectors, getting appriasals, going on showings and hiring movers you don't want to be weighted down with everything all at once. Make lists and timelines to keep you on track! The bottom line is this...buying a home is a big responsibility. It takes time and it takes money. But the end result, owning a home that is a good fit for you, is always worth it. So take a deep breath, plan ahead, make those lists and don't be too hard on yourself. Enjoy the process and enjoy your new home. The folks here at Julie Pogue Properties area always ready, willing and able to help you achieve your home buying goals and keep your stress level as low as possible. We do this every single day and can help you through the entire process. Give us a call when you're ready to start. Staging is a way for your home to stand out from the competition. It's a way for a buyer to see the true potential of your home. Many real estate agents work with professional stagers. But if you don't have the money to spend for professional help, then consider these five tips to stage your own home. Curb Appeal: A first impression happens only once! Prun overgrown plants and remove unnecessary clutter from your yard. For a finishing touch, consider painting your front door an attention grabbing color like dark blue, red or green. Remove Clutter: Knickknacks, doodads and bric-a-brac must go. When you put your home on the market, a showing could be scheduled at any point. So, for now, take a box and go from room to room collecting the extra 'stuff.' These unnecessary items distract homebuyers from seeing the actual room and space. Edit: It is not just clutter that needs removal from counters and shelves. Editing is a way of making your rooms look bigger. In staging you only have the bare essentials of furniture. Remove heavy pieces that make rooms look smaller. If you can, put these items into storage. As a very last resort, you can put them in the garage and cover them with a tarp. Main functions: This means that a dining room should be staged as a dining room, not as a sewing room or office. A patio is a place to relax with nature, not a catch-all for outdoor items, toys and grills. Amiance: You want to create an atmosphere that is welcoming and makes the buyer feel at home. This is the ultimate goal of staging. This means the home should smell celan, be light and airy and be a comfortable temperature. To accomplish these tasks, you can bake cookies prior to a showing to fill the air with yummy goodness. If you are a smoker or have pets, you may need to take more drastic measures such as repainting walls or celaning carpets and furniture. To bring your home to light, replace old and burnt out light bulbs and have heavy curtains opened or removed. If you are shoing during the winter months, be sure to leave the heat set to a comfortable temperature. The same goes for the air conditioning during the heat of summer. Use these simple tips to get your home shipshape for your sale. More ideas can be found on HGTV. Use your imagination, ask friends for candid advice, listen to your feedback from showings. All of these will aid you in putting your home in the best possible light for potential buyers. And, of course, we at Julie Pogue Properties are always ready, willing and able to assist you in all of your residentail real estate needs. There is an old German Proverb that goes something like this, 'You can't reset the winds. But you can adjust your sails!' Right now, there are many people coming through our real estate office that are moving in or out of our area. The state of the real estate market could cause them real stress. 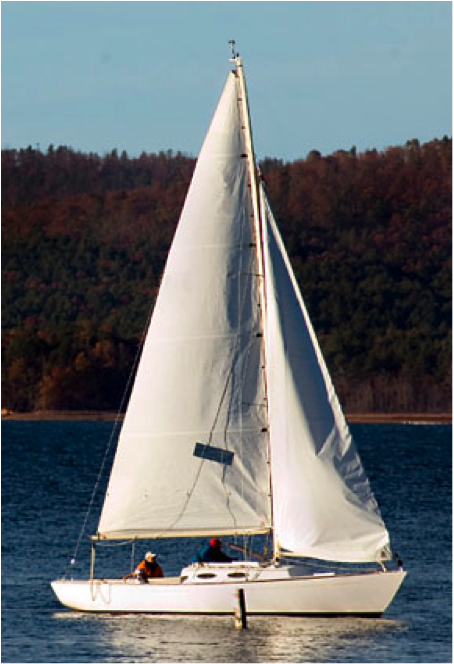 However, with our professional guidance, most of our clients choose to 'adjust their sails' so to speak. Let's just use an illustration of a couple who bought at the height of the real estate market and now find themselves facing relocation to another market. Instead of worrying about the money they were going to lose on the selling side they chose to focus on the money they were going to save on the home they were going to purchase in their new market. They sold their home for $300,000 and did have to bring $30,000 to the closing table. However, we were able to refer them to a very savvy real estate professional in their new market who was able to snag them a home that was listed for $650,000 in the fall of 2010 for just over $500,000 now. So they picked up about $150,000 on the new home, take away the loss of $30,000 and they are still up $120,000. Plus they will probably get a write off for selling their hom at a loss. Be sure to double-check with your own personal accountant for what you might realize in a similar situation as everyone's circumstances are different. My point here could be applied to anything in your life. Adjust your sails. The winds of our lives are in constant change. Adjust your sails to take advantage of the changing winds. Be willing to adjust to the changes in your life. In that willingness you will discover opportunity! By adjusting your sails you will continue to sail in the direction of your goals through the storms of life. Adjusting your course along the way will keep you on course. All of us at Julie Pogue Properties are here to help you stay on course with all of your real estate needs and to encourage you to live your best life. We can advise you on what the prevailing winds in the real estate market are and help you navigate your best deal. Call us today. Sellers often improve the outside appearance of their home, finish all those 'honey do' lists of repairs, remove wallpaper, paint, etc. before listing their home for sale in order to attract potential buyers. This clean up, paint up, fix up mode is all great in order to make your home shine above the competition. But what usually happens first when a buyer walks through your front door? They open a closet! Yes, those new countertops are fabulous and all of the stainless steel appliances are nice but cram all the clutter that you were told to eliminate from your home into the closets combined with out of season items, holiday decorations, board games and a vacuum cleaner in the front closet and guess what the top of mind notation about your home is going to be for this potential buyer? You guessed it--that there is not enough storage in this home! Now, instead of enjoying all of the other features your home may have, potential buyers will spend the rest of the tour with their antannae up for further proof that your home has too little storage space for their needs thus causing them to overlook things that they would otherwise have greater appreciation for if you had just cleared out the front closet. 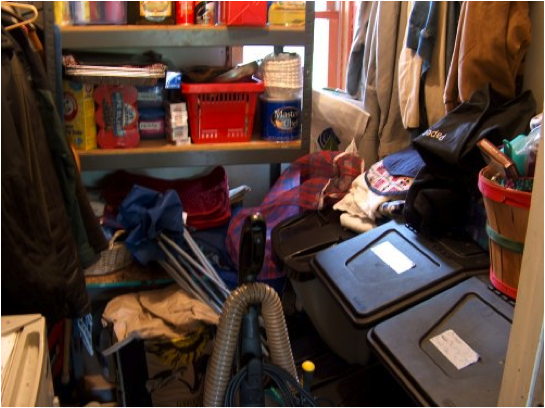 If you are considering putting your home up for sale, or, if it is already on the market and you are not happy with your potential buyer response, start at the front of the house and check every one of your closets with a critical eye. Look at each one as a potential buyer might see it. Pack up at least half, if not more out of each closet and let that space breathe! Plus you will be started toward boxing up things for your move anyway. Your never get a second chance to make a first impression. Clean those closets before you market your home! If you want us to take a peek at your home, give you a market estimate, etc. we are glad to do it. Just give us a call. We are ready, willing and able to serve all your residentail real estate needs. When you are ready to buy or sell a home, remember that a real estate transaction is very complicated, involving a great deal of money and risk. A local agent is always the safest choice. Local agents know their towns better than anyone else. Using a local Realtor® is in your best interest because they have pledged their code of conduct/ethics to a standard set by the National Realtor Association. They have your best interest in mind because they are committed to a long-term career in real estate and are continually upgrading their knowledge in the real estate market. A local agent will have superior market knowledge. A good local agent knows the inventory inside and out and will be able to more easily pick out homes that are a good fit for you. A local agent will know the schools and quite possibly have personal experience with the school system. This will enable them to share valuable information with you. A local agent will be an expert on the neighborhoods. Not only will they know all of the specific neighborhoods, but often have friends and clients in each one that can be made available to you if needed. Hearing from people who already live in a neighborhood you are considering can prove to be very helpful when it comes time to make decisions. A local agent will have strong relationships with other agents. A good local agent will network with other local agents to get information you will never find online. They will know about homes that may be coming on the market in the future or learn about a seller who has suddenly become 'highly motivated' and is open to offers. A local agent is overall in the know. Real estate gossip gets discussed in small circles in every community like at parent association meetings and at the local sports field. While most agents will never learn this 'insider information,' a local agent hears these things and will share them with their clients. A local agent will make sure you get settled in and connected with persons in your new neighborhood. They can help you with doctors, dry cleaners, veterinarians, churches and the like. And remember to use that agent relationship when you get ready to relocated. They can research and find a comparable agent for you in your new market that will keep your agent in the loop as you look for your new home. It is always advantageous to have a second pair of eyes that already knows and cares about you watching your back as you try and locate that new home in a new market. We at Julie Pogue Properties are always committed to helping you find that perfect home and are also willing to help you find excellent agents in other markets, if and when the time comes to relocate. Please don't hesitate to use our expertise and know that you can recommend us with confidence.